The All-on-4 dental implants procedure is designed to treat edentulous patients and those who are soon to be edentulous. It uses a patented four implant method to properly anchor teeth to the jaw. These can be dentures or prosthetic teeth, which can easily be attached after the procedure. While traditional dental implants can be used to replace individual missing teeth, all-on-4 is typically used for replacing a full set. Here we’ll look at the procedure and how much all on 4 dental implants cost. This procedure is perfect for people who are starting to lose their teeth and for those who have already lost some or all of their teeth. They will need replacements if they are to continue living as they are used to. Without the proper support and anchor, however, new prosthetic teeth and dentures may not be able to be securely fastened to the jaw. They can fall out and cause all sorts of problems, which is why dental implants are ideal. The All-on-4 method involves drilling to the jawline ever so slightly. Then four titanium bolts are implanted into the jawline and serve as anchoring measures or fasteners for whatever is going to be taking the place of the missing teeth. Without those anchors there, the teeth or dentures would fall out. This scientifically proven method of anchoring new teeth ensures that the patient can use their new prosthetics for a long time without any fear that they will fall out. These implants allow the entire stomatognathic system to function as it normally would. This includes chewing, swallowing and other functions vital to consuming food. The implants will not get in the way or cause any impairment whatsoever. Most patients who have these implants inserted into their jawline notice no difference between their old teeth and new teeth when it comes to eating. While the new teeth will start to feel normal after a while, during the first crucial weeks of healing, special dietary restrictions have to be adhered to. The anchors cannot be forced or moved in any way. If they are able to remain immobile for 6-8 weeks, then they can take hold and work perfectly over the long term. So during this time of healing, the patient will not be allowed to eat any hard or crunchy foods. While it can be difficult to keep up with a new diet, it is essential to providing long term stability to the implants. There only needs to be four implants along a single jawline. In the past, far more may have been needed, but technological advancements have allowed a very small number of implants to support a very large number of teeth. This ensure a minimum of discomfort and reserves most of the jawline space for the prosthetic teeth. There are other methods of replacing teeth, but they typically involve replacing teeth one at a time as they fall out. This is very impractical and extremely costly, especially when compared to the cost effectiveness and simplicity of the All-on-4 dental implant procedure. Replacing each of the 28 other teeth (excluding wisdom teeth) can be an excruciating process and it is not likely to provide any better results than this method. Simply put, no other method is as easy and painless for patients, and it has been proven to work effectively time and again. How Much Do All-On-4 Implants Cost? In the UK, the cost can vary between £6,000-£14,000. This includes the cost of the implants, the numerous visits to the specialist, the procedure itself and all other related expenses. Lower costs for a similar procedure can be found elsewhere, but consumers should be wary about the quality of the procedure and the skill of those involved. Here we will break down the costs of the individual parts of the process. The biggest cost will be for that of the procedure itself. Actually implanting the titanium anchors will be a procedure that requires experience and skill, and it will start at £3,000 and go up from there. Fitting the implant abutments will also be costly. Expect to pay a minimum of £1200 for this part of the process. An exact fit is required if the implants are going to be comfortable and last for a long time without complications. The attachments for the implants come with a couple of different options. 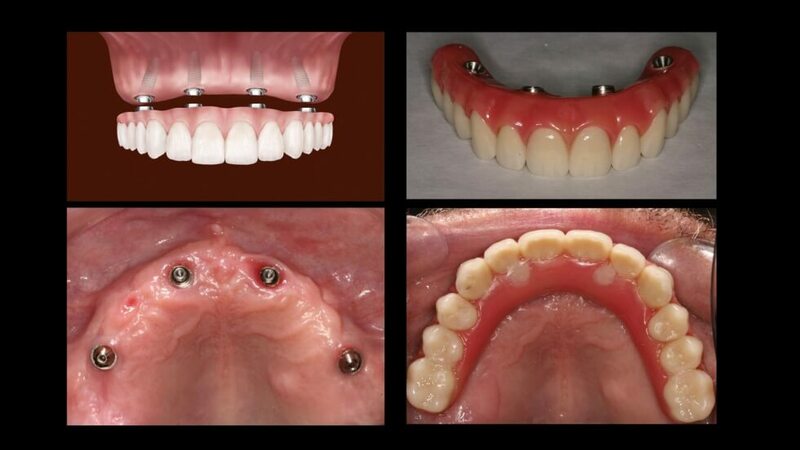 The most common method is to simply attach an acrylic prosthesis to the implant frame. This should cost as little as £1200 and as much as £4000 depending on what attachments you opt for. If you were to opt for an acrylic prosthesis on a titanium frame, you can expect to pay quite a bit more. This process will cost you around £3,000 to start, and will likely be more unless you do comparison shopping. The total costs are going to vary greatly depending on where you have the procedure done and what is involved in the process. If you need to have some of your teeth extracted, then that will cost more as well. If there is some deterioration the jawline, then reinforcing it can become costly too. Consult with your orthodontist and maxillofacial surgeon about your options. You may find affordable options that work every bit as well as some of the more expensive ones. Once you reach adolescence, your teeth are not going to grow back. After you lose them, they are gone for good, and if you start to lose very many, then you are going to run into a number of problems. Your most immediate problem will be that of the difficulty you experience while eating. There will be spaces between your teeth that don’t allow you to eat food the way you used to. You will also likely experience a shifting of your remaining teeth. They may lean or move to try to fill in the missing spaces. Normally, they would be held in place by surrounding teeth, but once those are gone, your teeth can start to go awry, giving you an unpleasant smile and an unwieldy bite. It is essential that you replace your missing teeth as soon as possible to avoid these complications and others.